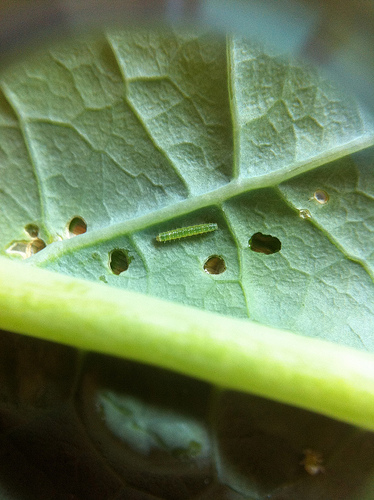 Controlling Cabbage Worms: No Insecticides! Cabbage worms are common pests that attack many vegetables. Cabbage and kale are particularly susceptible to these pests, but some other vegetables can also be a target of these insects. Keep in mind that cabbage worms have a great appetite. It only takes a few of them to completely ruin your plants. This is why it’s so important to know how to control them. Pest control is always a potentially dangerous business, because many products and chemical used to get rid of pests can harm your plants. This is why it’s always best to use organic methods of pest control that will not damage your plants or the soil in your garden. It may sound gross, but it’s actually one of the most effective methods to get rid of cabbage worms. Handpicking is best done in the morning. It is a good way to remove many of the worms directly from the plants. You may dust your plants’ leaves with rye flour, corn meal or a mixture of one part salt to two parts flour. Cabbage worms will eat this dusting, which will make them bloat and die. A good way to avoid cabbage worms is to use some form of a barrier, such as netting or fleece cover. It’s important that the material you choose allows for air, sun and rain to get through, while keeping the worms and adult insects from getting to your plants. Good ways to go are nylon netting, fine screening or agricultural fleece. They all make very effective barriers for both butterflies and worms. The adults can’t lay their eggs on the plants and worms can’t reach the leaves to eat them. Another good material to use is the stocking part of the pantyhose. It can be used to cover individual cabbage heads as soon as they start to form. The nylon can easily be stretched as the cabbage grows. It will also allow air, sun and moisture to go through but it will leave pests away from your plants. It’s important to cover your plants straight away, right after you plant them in the garden. This will prevent adult moths from ever getting to the plants and laying eggs on them. It’s best to drape the barrier material directly over your plants. Also, make sure to seal all the edges to the ground. Make sure you have a lot of extra material so when your plants grow they will still be under the covering. If you wish to get rid of pests, it might be useful to attract beneficial insects that are known to control the pest population. Parasitic (non-stinging) wasp is known to paratize the eggs of imported cabbage worms, thus controlling their population. You can attract these wasps by planting flowers that look like daisies in your garden. Another good thing to use to prevent pests is to plant companion plants. These plants will prevent moths and cabbage worms from getting to your main plants. This method is not science based, but many gardeners claim that it does help prevent numerous types of pests, so you may try it out. One good method of killing adult cabbage moths is to hit them with a racquet. Badminton racquets seem to work the best for this purpose. However, keep in mind that this method requires some skill or else you will damage your garden plants and flowers if you hit them with the racquet.